It is a period of annual leave for me, which finds me using the time to perform house renovations in preparation for the arrival of our son in September. "There never seems to be enough time to do all the nothing you want", as Calvin from Calvin and Hobbes once lamented. I take some time out of my battling with doors and chimneys to enjoy this cake, kindly provided by Keng. Shuangxiong [shwang-shyong] means "Double Hero"; they are based in Yongde, out in Lincang, which makes them "remote". I like outliers. 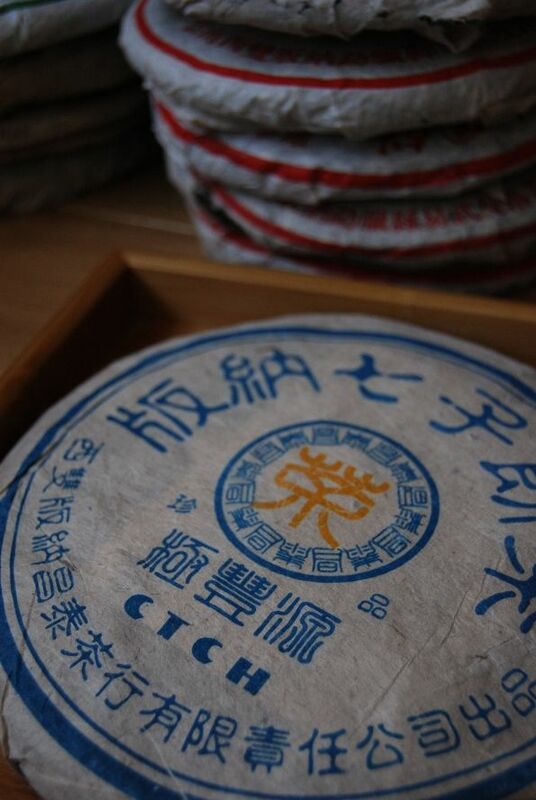 As the wrapper suggested, pictured above, 2,000 kg of this tea was produced - making 800 tong, one of which now rests on our shelf, thanks to Keng. 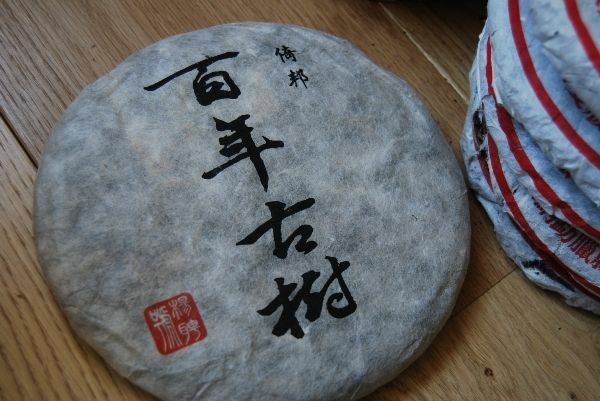 The wrapper also suggests that this cake was selected for a tea competition, though, as Lei notes, "This could mean anything - Chinese people are very good at keeping such statements vague, in order to convey a good impression." Shown below, the soup is a decent yellow-orange, the kind of colour that one could imagine came from gently maturing on a shelf somewhere. I appreciate its thickness, and its sharp, pinewood character. 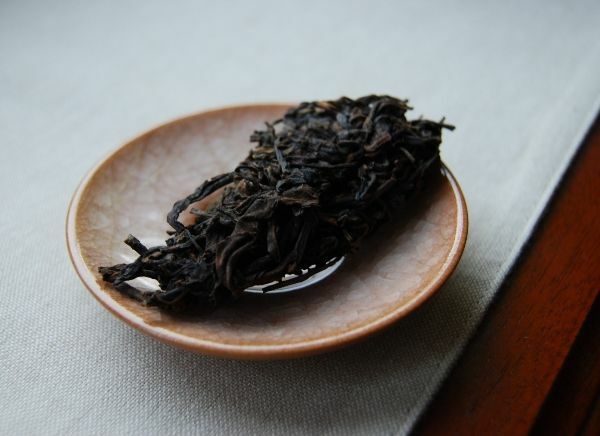 The remaining presence of kuwei [bitter flavour] is highly enjoyable, combined with its "adolescent" nature. In terms of pu'er enjoyment, this is approximately just about right for me: woody, yet still bitter. This is a clean, well-made tea that balances content and power nicely, while enduring longer than my appetite. 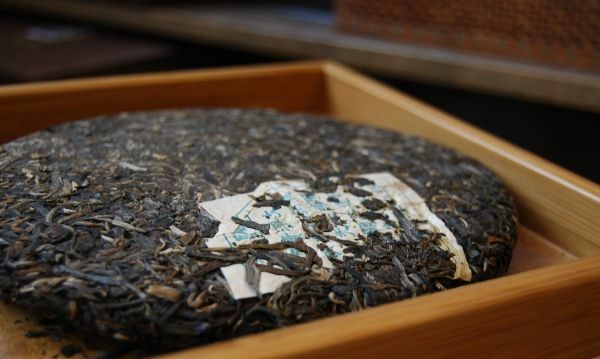 It came up in a comparative tasting in the Chinese version of the "Art of Tea" magazine, where Mr. Fisher noted that he enjoyed most of all the field, but also that none of the field were really particularly excellent. Time has been kind to this cake, and my feelings towards it are seemingly more positive than those of Mr. Fisher - I would rate this as being a "very good" cake, rather than being close to average. Perhaps I am swayed by the relative unavailability of good seven-year-old tea, but I found it tasty and enjoyable. I have a tong + one cake from this "Double Hero" cake. It seems that I last drank this cake five years ago, while waiting for the arrival of our eldest son, Xiaohu. He is now awaiting the arrival of his first term at school! The flavour of the tea is warm, malted, and rather like sultanas. 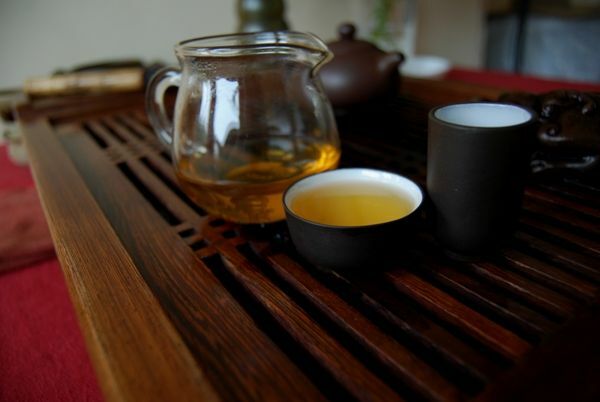 It is a vivid and powerful tea, which wakes me from my half-slumbers. While not complex, there is an enduring huigan that remains most enjoyable. 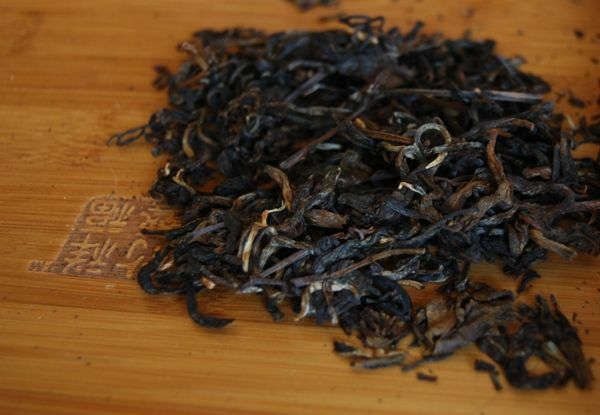 A scent from the wenxiangbei captures my attention: it is dense, long-lasting, and caramelised. The scent alone is "big". I am beginning to understand why I opted to buy a substantial quantity of this tea, back in 2010. 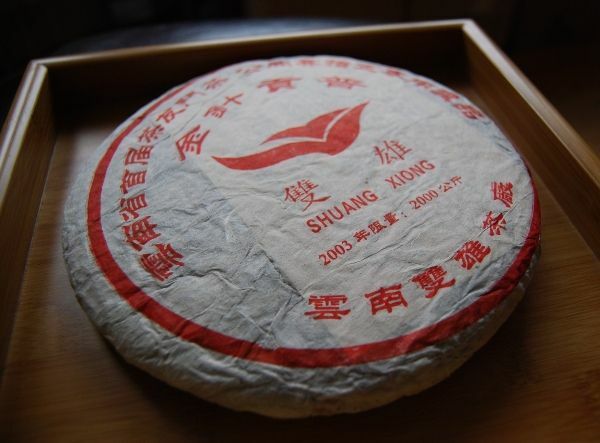 The Shuangxiong cake is stable, heavy, and especially good fun. I am left feeling warm, as if reunited with an old friend. For years, I never paid 6FTM any notice, after being scared away from them during 2006, by which point their productions (or at least those I encountered) were dross akin to modern-day CNNP. 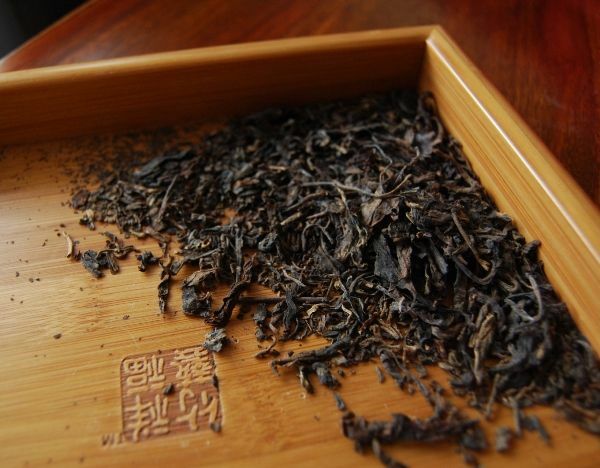 So, it was a real delight to receive the 2003 "Fengqing Lushi" from Keng, that I described previously - it showed me that 6FTM were great, once upon a time. In a similar vein, this even earlier cake is testament to the fact that 6FTM know (or, perhaps, knew) how to make good tea. 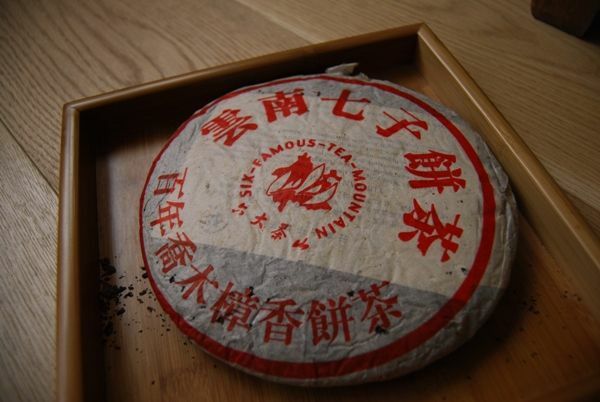 It's also a good case-study for why the old chestnut about buying pre-2006 pu'er before it becomes too expensive can be sensible. The cake's name means "100-year tall-tree camphor-scent", and this really is scented strongly of camphor. 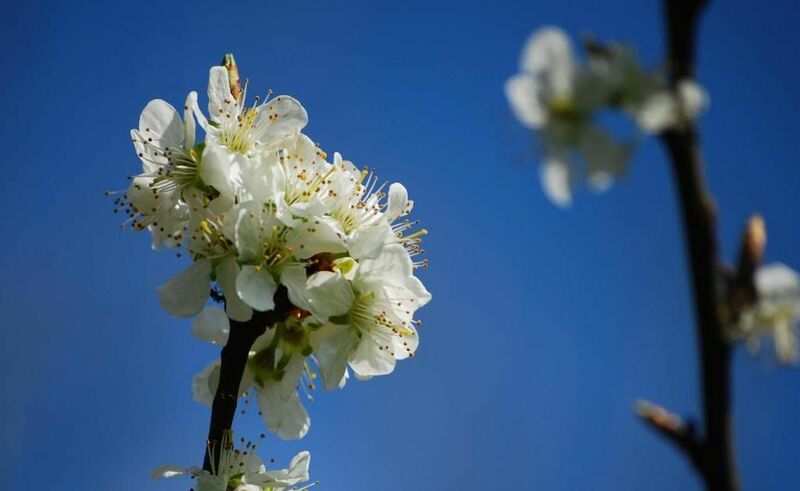 It refers, of course, to the camphor trees that are planted between pu'er trees to prevent pests. 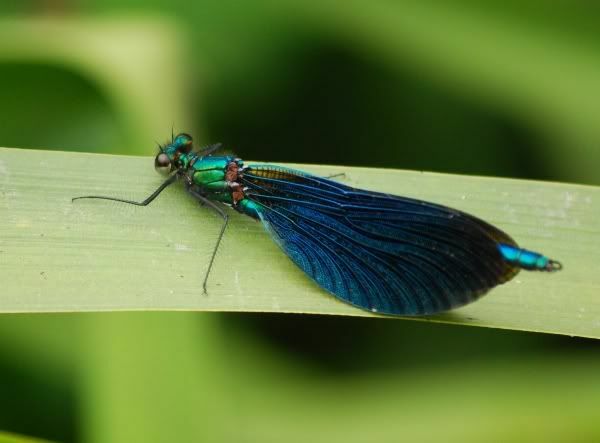 Organic pesticide, if you will. Looking at the photograph above, you'll notice large, broad leaves, and you'll probably be imagining that they are brittle - which they are. You may be able to tell that the cake has become somewhat dark orange in colour. By the time a cake is 8 years of age, it's difficult to tell if that orange colour comes from maturity of artifice, given that they tend towards this colour after a while. 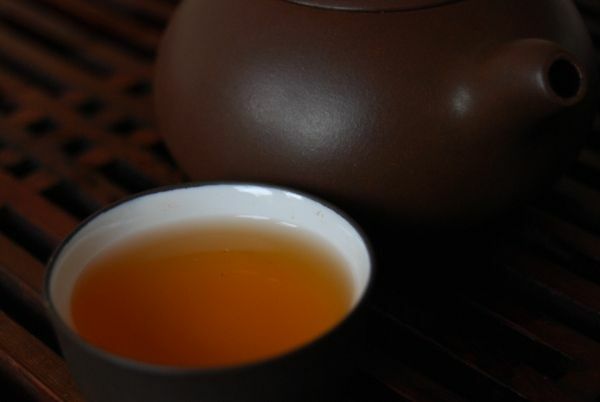 It brews up a heavy orange-red, as pictured below, and has a thick, tarry aroma mixed in with that obvious camphor (zhangxiang) component. My dear wife passes by, commenting "This one has a wonderful scent - quite old." 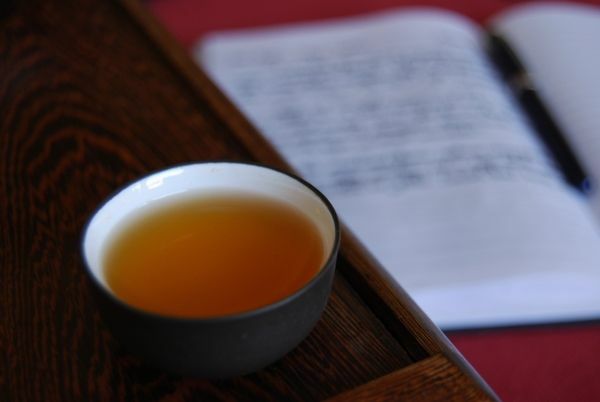 The body of the tea is satisfyingly thick and woody, with plenty more camphor in the finish. Plenty of sharp bitterness remains, which is excellent - it gives the impression that maturing process has something to work on, and that it wasn't neutered during production. I also enjoyed its potency and longevity, which are similarly orthodox features of what some describe as being good for aging. 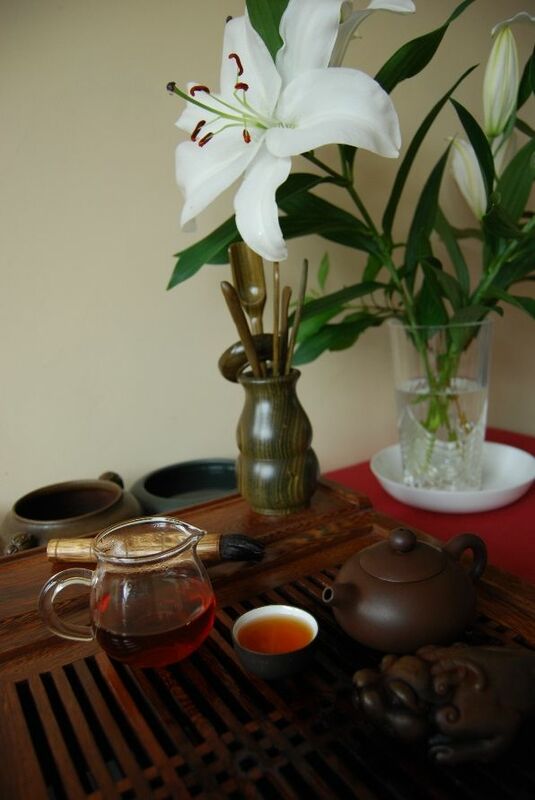 On top of it all, I noticed the cooling sensations and long huigan of a good tea. This cake is a real treat, and I pestered Keng into buying a few on my behalf - thanks again! Zhimingdu [djer-ming-doo] is a Taobao vendor of some reknown, who, like everyone else, has started recently producing their own cakes. This is usually A Good Thing, because such productions typically cut out the middlemen (distributors, etc.) and pass on the savings to the customer. China Chadao has stocked up on these xiaobing - you may remember my previous notes on the Lao Banzhang, which was the priciest of this ZMD series, as is the norm for Banzhang. 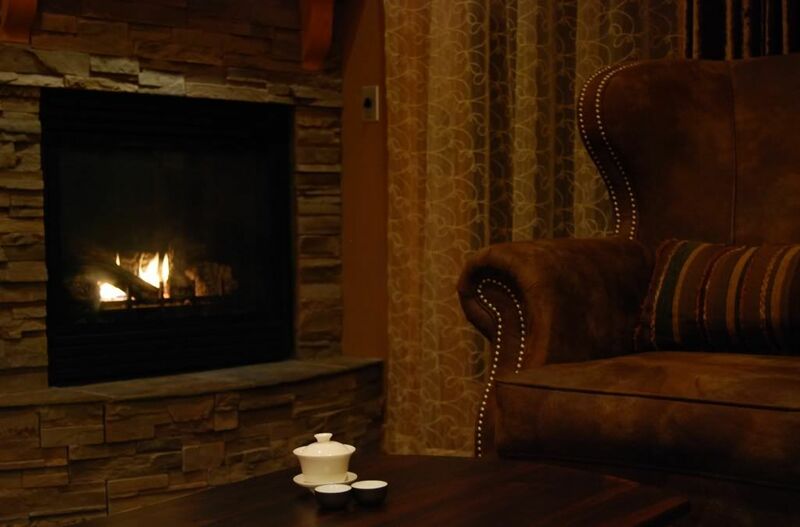 Let's take a whistle-stop tour through three new tea-areas. I had six months away from being able to drink tea "properly" (i.e., at home), while we were in the most dramatic stage of our house reconstruction. During that time, I casually brewed a few cakes that I had found knocking around in my office. One of them was the 2009 Menghai "Bada Organic" - I haven't written notes for it, but it's the cake with the huge hand-written "Bada" on the front (as shown in the image above), and which was supposedly produced at the request of an individual somewhere outside Yunnan (which may have been Guangzhou or Hong Kong). 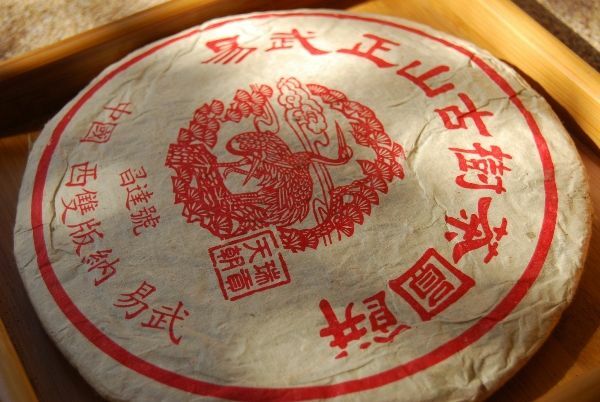 I brewed that Menghai cake several times per week, and became very well-acquainted with it. 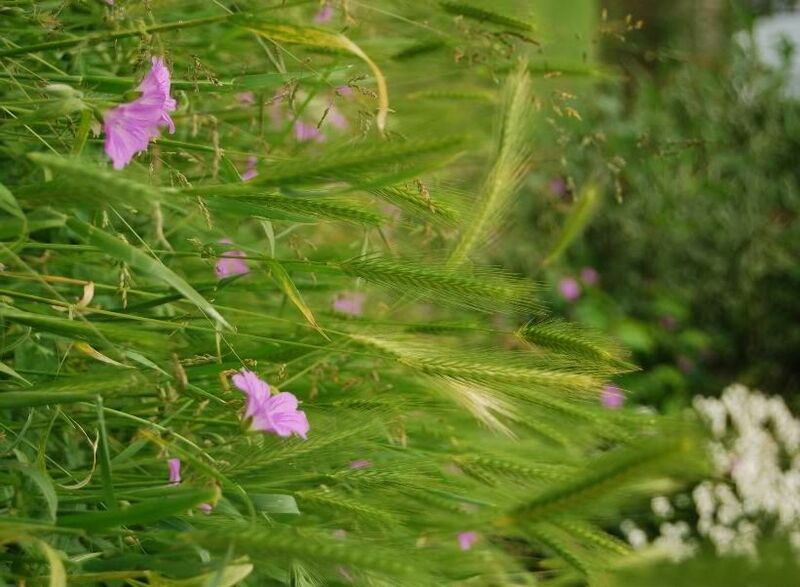 The leaves are long and dark, with a heavy tobacco scent. The tiny Xiaguan "Happy Tuocha" is shown for scale. 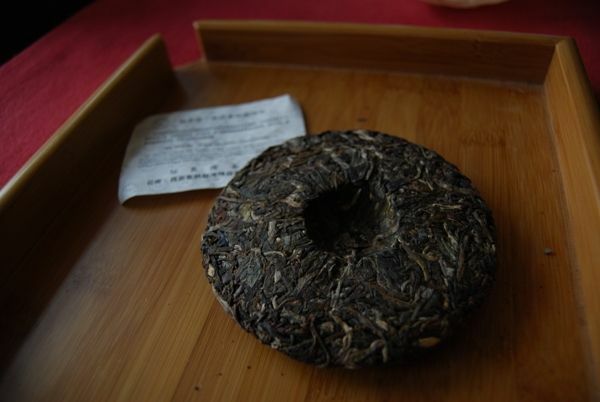 I found that the Menghai "Bada" cake was grassy and sweet, in a particular way - a very distinct grassiness that you'll probably only recognise after trying it several times. An idiosyncratic grassiness. 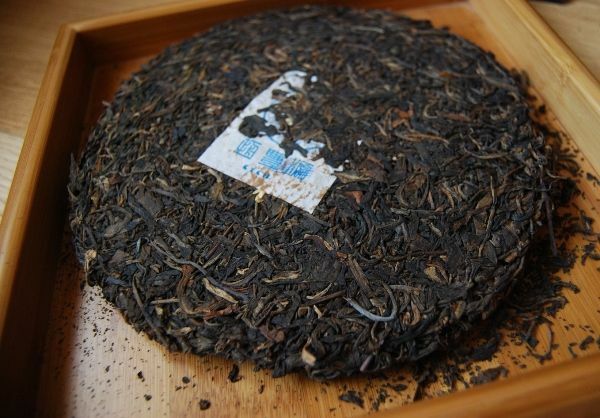 Nada's 2010 "Bada" cake (more of which later) exhibits precisely the same grassiness - as does this Zhimingdu. At $14, this cake is much less expensive than the $35 Lao Banzhang (which I would say is a wee bit expensive for what it is). I'm of the opinion that "LBZ" isn't usually worth paying for, unless it's a stunning example. The premium is just too high. Hence, I like to look at tea from other mountains. This Bada is sugary, clean, and reassuringly yellow. It has a delightfully swollen body of heavy leather, and is decidedly chunky. In fact, it's much chunkier than Nada's 2010 Bada, which is more elegant and refined. 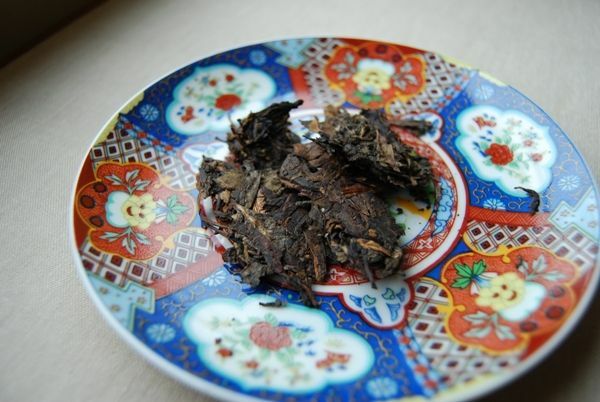 This Zhimingdu is clearly made from at least some plantation leaves, but is a very decent example of the mountain - I would thoroughly recommend it in prefernce to the 2009 Menghai Bada, for example. 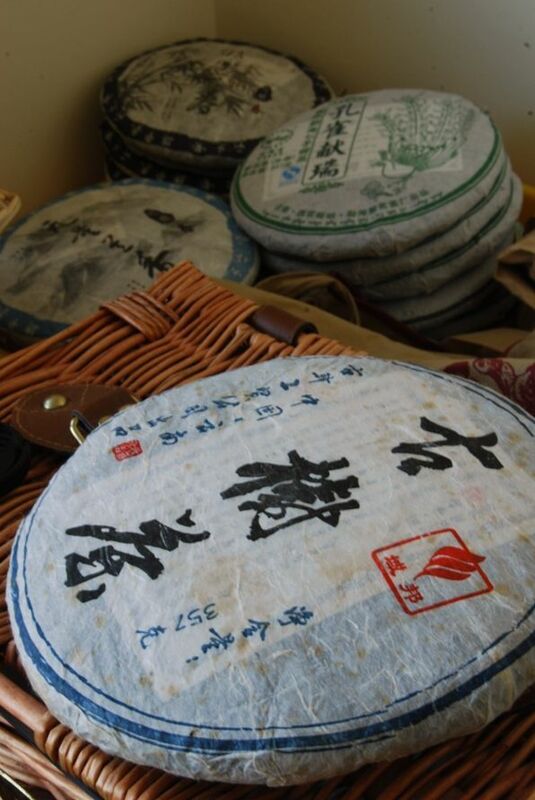 Nakashan is in the Mengsong region, and so we might compare this cake to the 2009 Douji "Naka" or the 2009 Nadacha "Naka". The former was husky and grainy, the latter was creamy and green. The two have little in common. 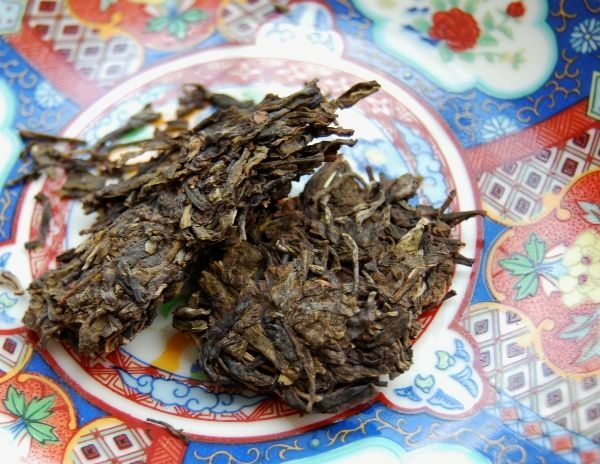 This Zhimingdu comes down somewhere between the two: it has the granary nature of the Douji, and the creaminess of the Nadacha. In fact, its extreme creaminess reminds me of the lovely little Douji "Dadou" and "Shengdou" bricks that crop up from time to time. It is a lively, vivid tea. 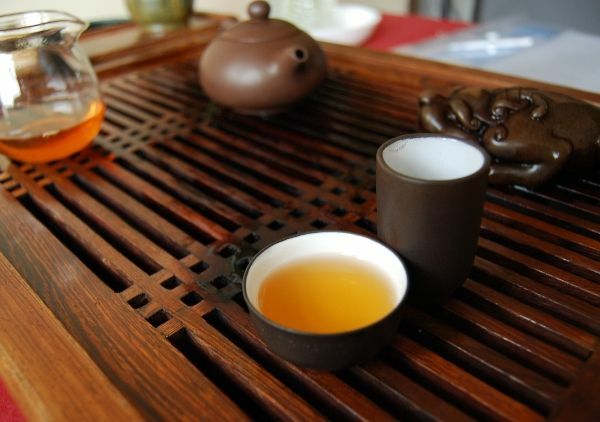 Like the other Zhimingdu, it is a very good second-division tea. While not quite the premium examples of some hand-selected productions, these ZMD are very good mainstream cakes. It tastes like the better end of Dayi or Mengyang Guoyan productions. I usually like Bulang cakes. They can be really aggressive, and I am immediately reminded of the agreeable torment of the 2009 Nadacha "Bulang" (and the 2010 Nadacha "Bulang" follows in its monstrous footsteps). This one is unexpected, containing the cereal-like character that I would usually associate with Lincang pu'er. It lasts well in the throat, and is suitably powerful. There is even a suggestion of a "cooling" character in the mouth. By the third infusion, it has opened into a plantation "brown-ness", alongside its sweet, cereal nature. All three represent fun little bite-sized tasters of the invididual mountains, and have some of the characteristics that I have come to associate with each. While they are not the very finest grade of leaf, as one would anticipate for mainstream cakes, they are solid. Outside of the Laobanzhang cake, they are also rather decent value, on the Western scale, mostly being priced within the $10-$14 range. "Testers" are usually priced a little higher than full cakes, and this is a decent set. Thanks again to China Chadao for the opportunity to try the first hand-selected productions from a popular vendor. Keng has very generously provided Lei and me with another cake from this producer that we've not encountered before - the "Yubang" label from the "Guyi" company. 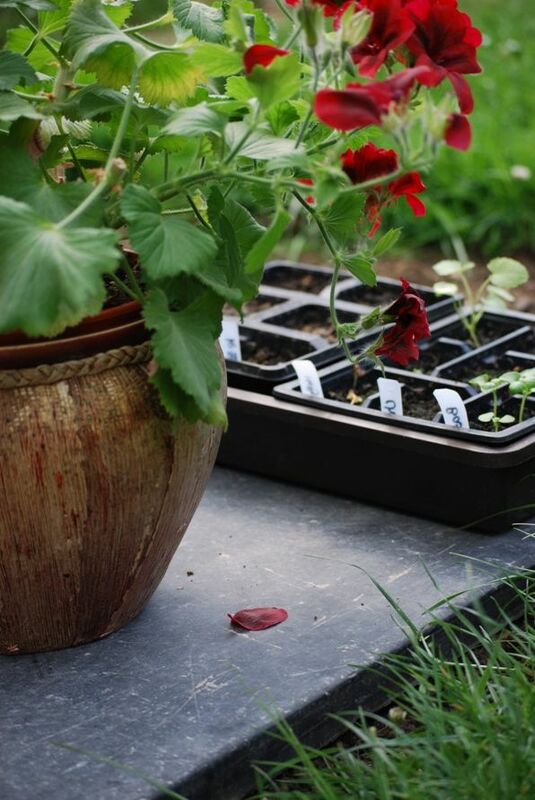 The cake is appealing from the outset: we have good, long leaves, which are a healthy shade of black, tending to lighter shades in the tips - just as nature intended. Happily, this continues into the brew itself, which is a charming yellow. 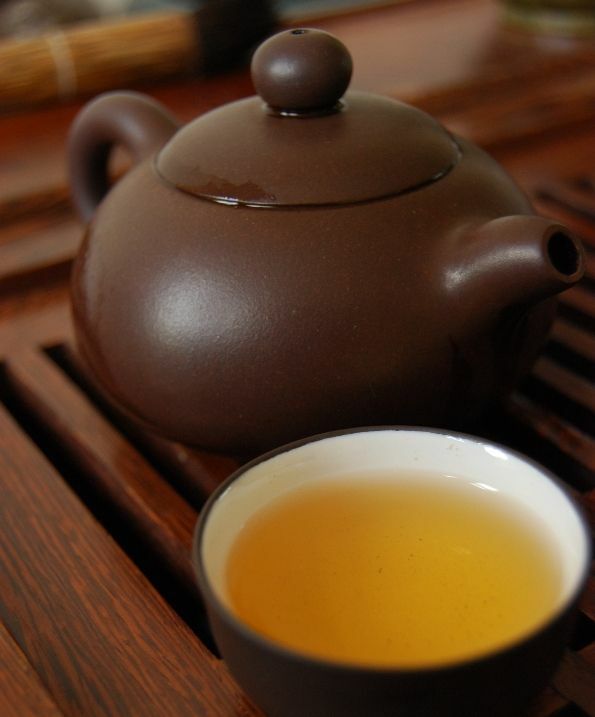 My mouth begins to water afresh as I recall its sweet, buttery scent of good Yiwu. This isn't an expensive, grand tea, but it is very enjoyable and decent quality. It cools the mouth, and is clean and sweet. Some kuwei [bitterness] remains, giving the aging process something to get to work on. Marching on through the infusions, it shows no sign of failing, and gently recedes into a warm sweetness. I could well believe that this comes from Yiwu "proper" [zhengshan], given its charm. 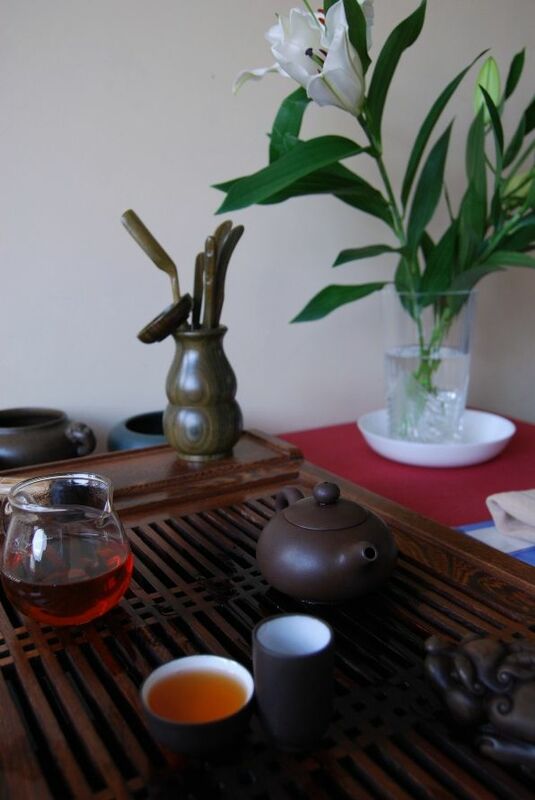 Being stable and enjoyable, this is easily worth the $28 asking price at Tuocha Tea, for example. 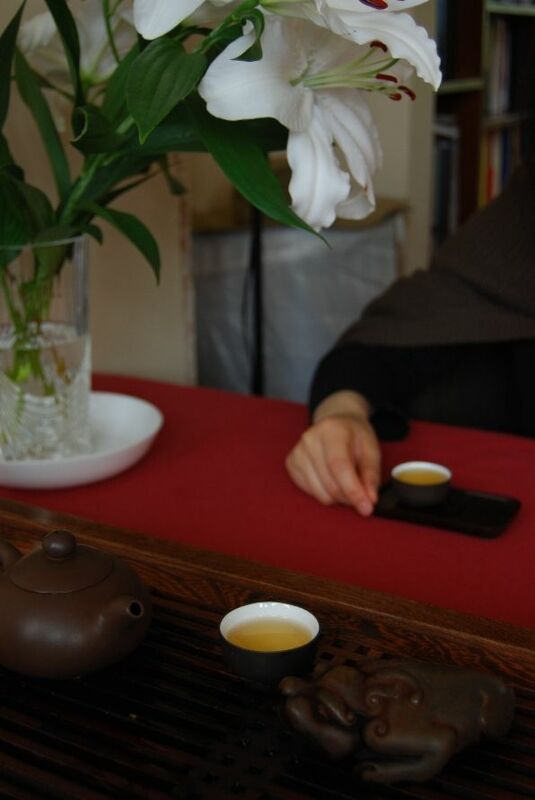 Here's a tea that gives me hope - the hope that our young shengpu will turn into something lovely. 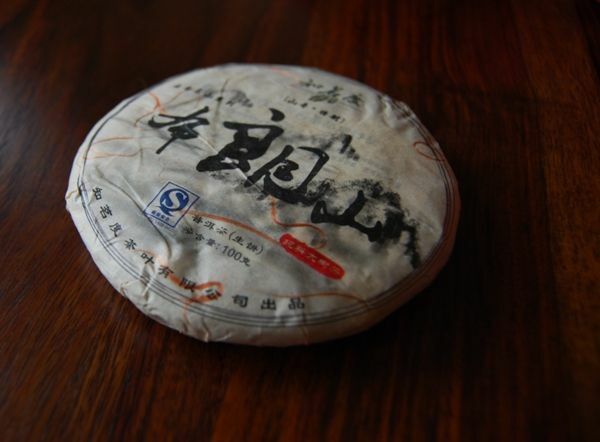 Houde named this "zhuan" [djoo-an] after the style of characters (seal script) used by Changtai on the wrapper. However, nearly all Yichanghao cakes are like this. Its actual name is the equally uninspiring "Yiwu Qizi Bingcha". Having bought this sample from Houde over two years ago, I thought it high time that I stopped neglecting it. The poor thing has been sat in its plastic wrapper for that entire period. I like Changtai. 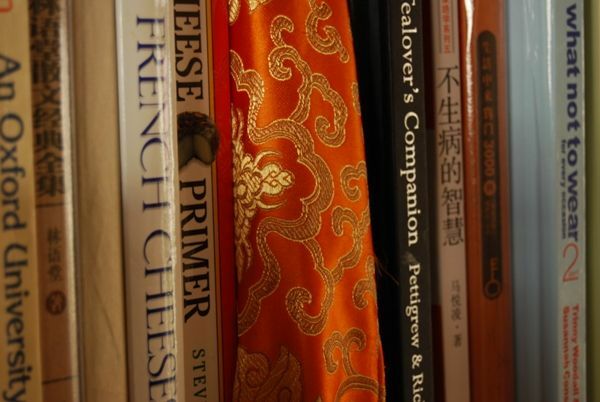 As long as you steer clear of the numbered recipes, their "premium" brands (though not terribly expensive, relative to other producers) can be very reliable. 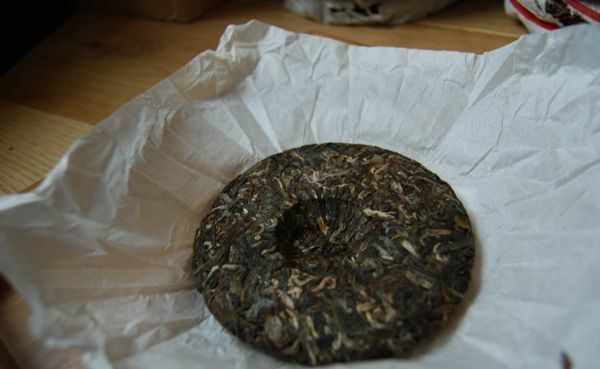 Perhaps that's just my preference for chunky, challenging pu'er - they're not particularly elegant, but they are big, bold, and they age nicely. Their Yichanghao brand is very reliable. Their Jifengyuan and Qianjiafeng [ch'ean jee'ah fung] brands are less familiar to me, but seem similarly decent based on my limited exposure to them. This is, I think, the oldest Yichanghao that I have encountered. It's a delicious tea. Given the various other Yiwu cakes I've had from the same brand of younger age, I very much hope that they will age into something similar. It's not unreasonable to assume that the production has been fairly stable in terms of quality and processing, and so my hopes are quite high. It just lasts forever, and won't give up. 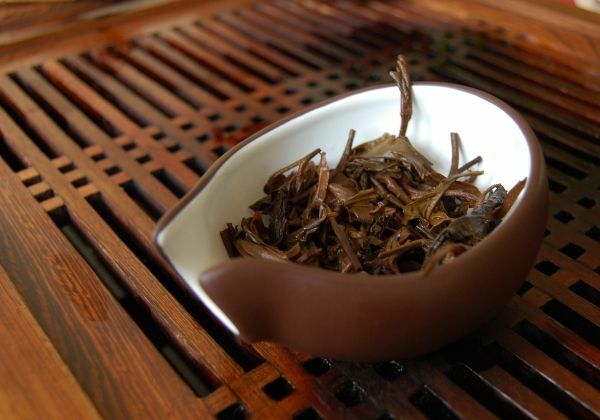 While still showing signs of youth, having a (very welcome) bitter twang in the finish, this has developed a heavy, wooden character that combines very well with its potent Yiwu straw-like sweetness. It marches on and on, and I eventually run out of spring water before the leaves run out of strength. Be of good cheer! Buy strong, properly raw shengpu and maybe it'll end up like this. Wouldn't that be something? From the cornucopia which is Keng's generous tea collection, this is a cake from a factory that is new to me. I'm delighted and impressed to read that the mighty Babelcarp already has information containing this factory (Guyi, meaning "ancient postal-road") and this brand (Yubang). Many thanks to Keng for this delightful cake, and to LP for maintaining 'Carp, an essential ingredient of most of our tea-lives. I used to be suspicious of brands that I've not heard of before, but, after encountering so many varied and wonderful cakes under all manner of labels, I have now come to be quite excited by new brands. "You never know what you're gonna get", as I believe Dryden once penned. This cake has it all: tips, whole leaves, stems, and huangpian [yellow flakes] - just the way I like it. 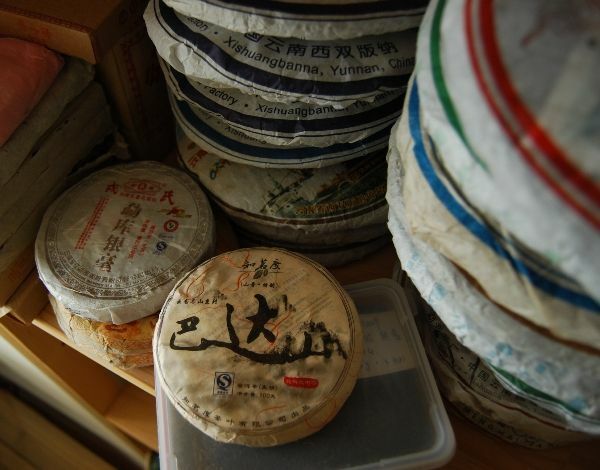 In its distant past, some wet storage - the shicang aroma is present, but very distant. This tea doesn't really taste of very much. But that's OK. This cake is one of that curious subgenre of tea that I call "CDV"s - chaqi delivery vehicles. 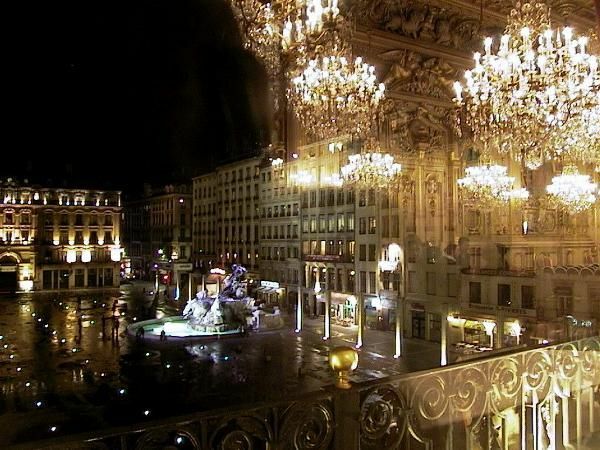 It is a mobile platform for the conveyance of weird and wonderful sensations. The cooling effect is perhaps the most pronounced that I have ever experienced in pu'ercha, being almost anaesthetic on the tongue. "Is this fertiliser?" I hear you wonder. 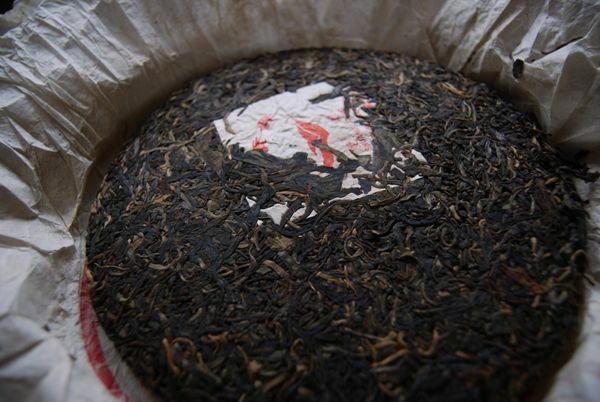 Unlikely - the body is thick, and there exists a huge potency about the brew that smacks of high-quality leaves. If I had to gamble, I'd say that this was, in large part, actual "gushu" [ancient tree], just as its name claims. Such is its potency that it could be little else. 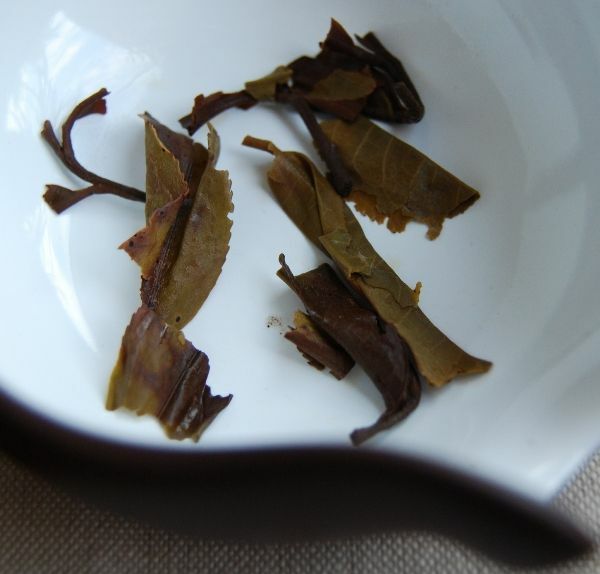 I can also appreciate why some producers have faith in the blending of leaves: this anaesthetic effect is rather overpowering, and one could imagine that it could be used to provide an extra dimension of complexity when blended with leaves that deliver a strong flavour. Its thin sandalwood character is highly enjoyable on its own, however. Thanks to Keng for the opportunity to try it. Neither Yongpinhao nor Yangqinghao, but Yangpinhao - a producer from the capital of Xishuangbanna. Thanks to Keng for providing this cake. The name is "Hundred-Year Ancient-Tree" Is it ancient if it's a hundred years old? Maybe that depends which area of the world you live in. Snicker. 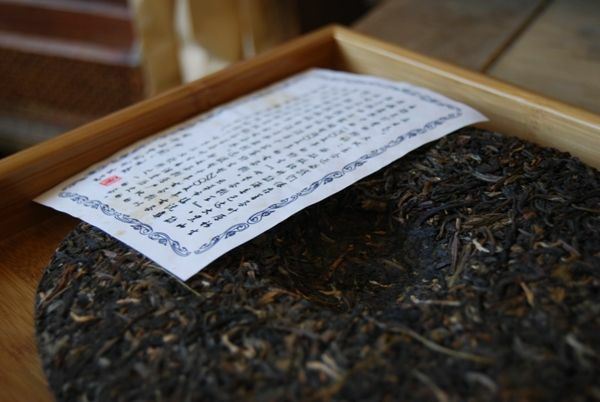 The little characters to the right read "Yibang", one of the N famous tea mountains in Mengla County of Xishuangbanna. 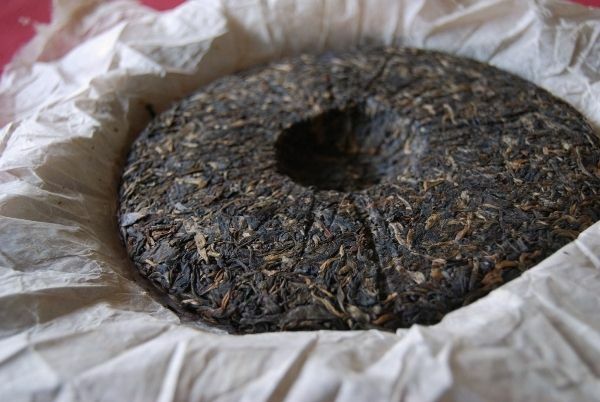 I don't have a good feel for Yibangshan tea; single-mountain cakes from the famous mountains are fairly unusual: you don't see a lot of pu'ercha labelled "Gedeng" or "Mangzhi". Maybe Youle and Manzhuan are less uncommon. They don't seem to draw the crowds the way in the same way as "ZOMG BANZHANG" or "I Can't Believe It's Not Yiwu". The game's afoot from the instant that the cake shrugs off its daywear, and slips into something a little more comfortable: strong scents of chunky sweetness abound. 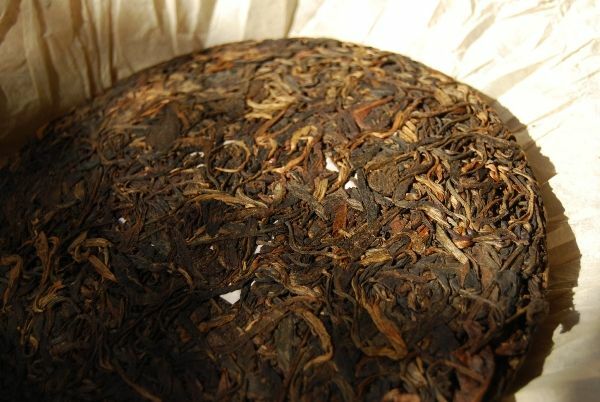 Some red leaves can be seen in the cake (pictured above) and in the leaves (shown below), but the majority are good, honest raw leaves. The strength of the aroma alone hints that this has plenty of potency remaining. Thanks in advance to all those who noted that I misspelled "bainian" and "mansai"
The soup turns out somewhere between orange and yellow, just as you'd hope for a cake that's six years old. 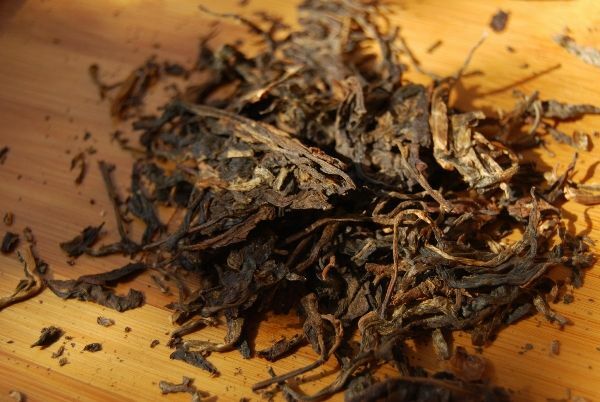 This continues into the flavour, which is a good, sharp woodiness with plenty of kuwei [bitterness]. It is surprisingly complex, containing buckets of floral notes over the top, and a bold tobacco-leather component that remains in the nose. It's easy to imagine how this cake started out: forthright, complex, sweet, and floral. Much of it has remained, yet somewhat mellowed in that sharp woodiness. It's a really nice example of good aging, and gives me plenty of hope for our own pu'ercha that is potent and yellow during its youth. Thanks again to Keng for a sincere treat. Yunnan Sourcing made some excellent cakes last year - the Guafengzhai was a favourite of mine, which appears to have sold out (and deservedly so). This is one that I've just caught up to tasting, with thanks to Terje for the sample. Ailaoshan is a Simao mountain, and Scott writes that this comes from Wang Jia village, at an altitude of 2,200m above sea-level. 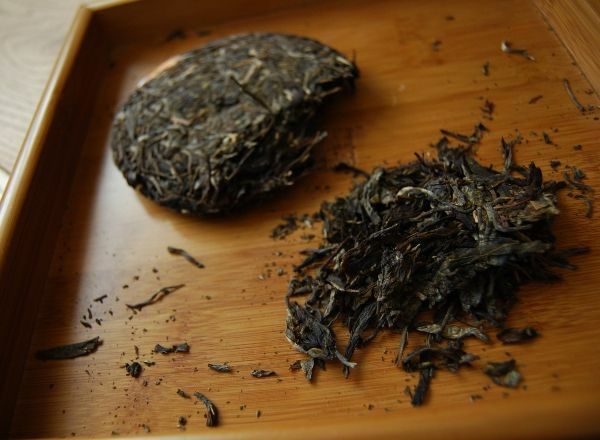 He also notes the presence of thicker, fatter buds that "make this more like a Jinggu tea" than the usual orchid-scented [lanxiang] teas from nearby Wuliangshan. An obvious buttery roast opens the aroma, and this feeling of heavy heat presence persists. It is sweet, gentle, and approachable - but not the jaunty, energising affair of its sister cakes from 2009. A portion of the leaves' original kuwei [bitter flavour] remains, but it really isn't enough to satisfy my desire for a tea with real content. Most of Scott's teas are priced quite fairly, and this is no exception - at $22, we shouldn't expect miracles. This is a pleasant cake, but not up to the heights scaled by some of the others in the 2009 Yunzhiyuan series. I look forward to tasting what 2010 has on offer from the same label. 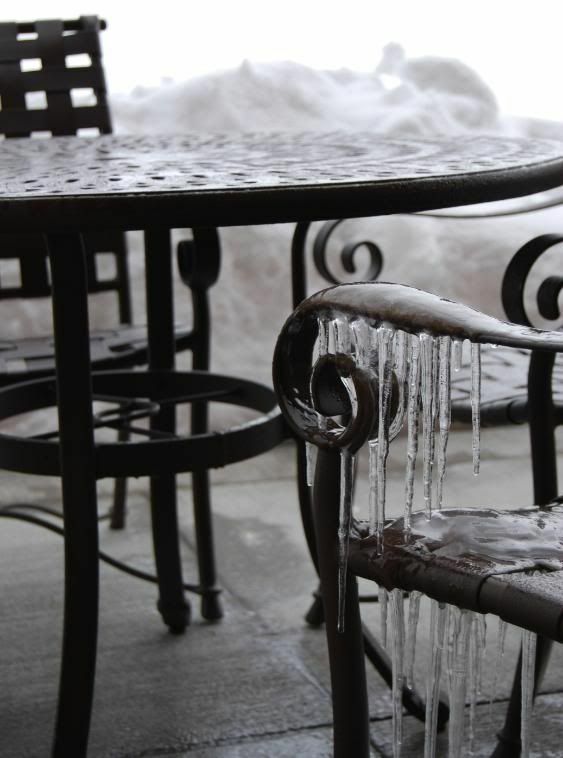 Three cheers for wet storage! How zheng is your zhengshan? I do love me some shicang [sher-tsang, wet storehouse]. Thanks to Keng for supplying us with a fine example of the genre. Judging from its clean aroma, this one has been in dry storage for its recent years. You can almost smell the beautifully acrid stench of flinty shicang from the photograph. As pictured below, the leaves are, however, very clean. 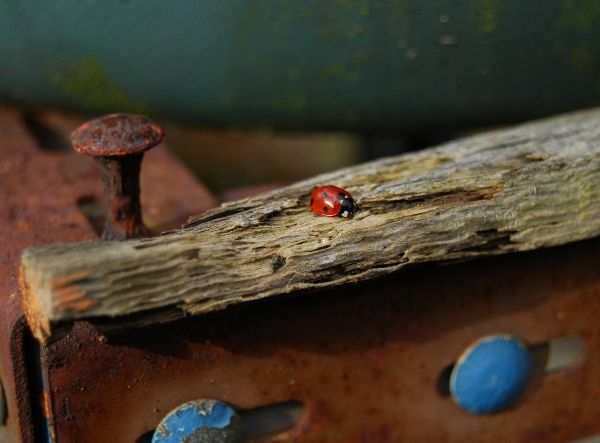 This one has been quite heavily stored in its past life, and it has affected its longevity. You can't hurry greatness. That said, this is a cake of very decent quality, providing a gloopy, thick soup that coats the interior of the mouth like an adhesive. You can almost slice it. P.s. 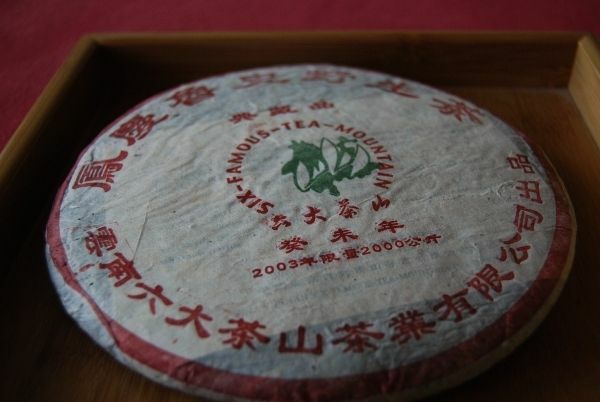 I just realised that "Changdahao" is the brand of one my favourite cakes, the 2005 Yiwu Zhengshan, which I previously knew as "Yiwu Manluo" (which is the tea company that makes the Changdahao brand)... So, in some ways, this 2003 cake could be seen as a precursor to my old 2005 favourite. They are not dissimilar, though the 2005 has greater endurance. P.p.s. A quick update after trying this one alongside the 2005 mentioned above: the 2003 is more "tar-like", and a touch emptier. It's harder to get started, and doesn't unfold quite as well. 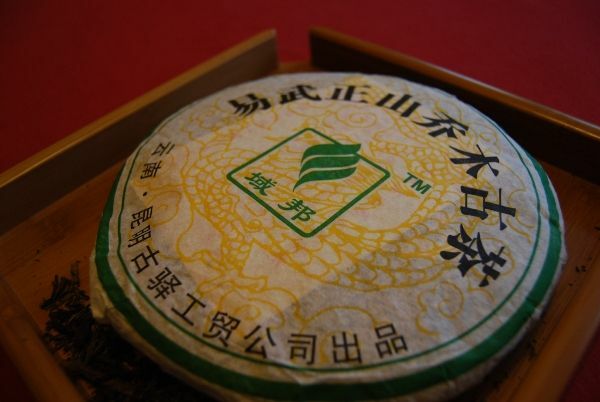 I notice from Taobao that Manluo / Changdaohao have two overall types of cake: the stork-logo cake (as with this 2003), and the zhong-cha-style cake (as with the 2005). It could be that the latter are the stronger cakes - I'll order a few random examples of both types from random vendors. This is a tea of some history, it having been rather popular back in the Dark Ages. Thanks to Jing of London for providing this sample, where it sells for £135 £132.50* ($200). A mighty price, but, as I wrote before, I'm sure that Jing aren't interested in selling to the likes of me and thee. 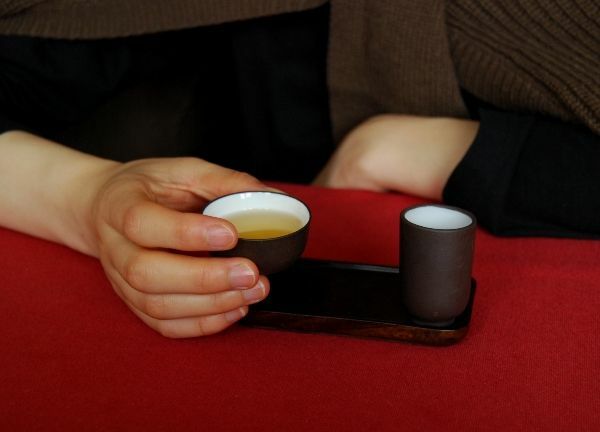 They do a decent job of getting tea through to the masses (i.e., the sane majority of the population that has no interest in reading about tea via the internet, which rules us out), and they've been in the national press a few times here in Blighty. 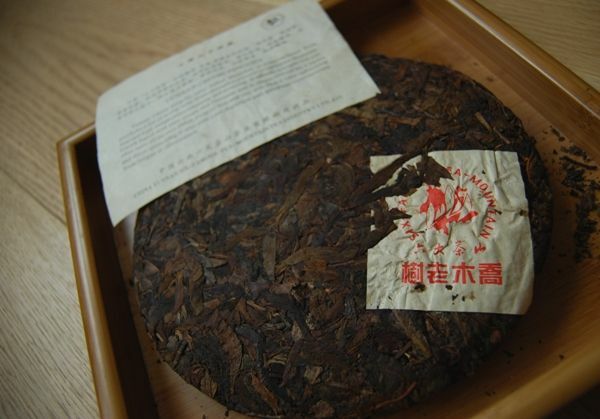 "Sweet tobacco and blahblah flavours with a blahblah mouthfeel"
Though I don't have an image of the wrapper, it's one of those old-fashioned Dayi with a big, chubby red "Dayi" in the centre, and large simplified characters around the edge that read "Yiwu Zhengshan" [Yiwu proper-mountain]. 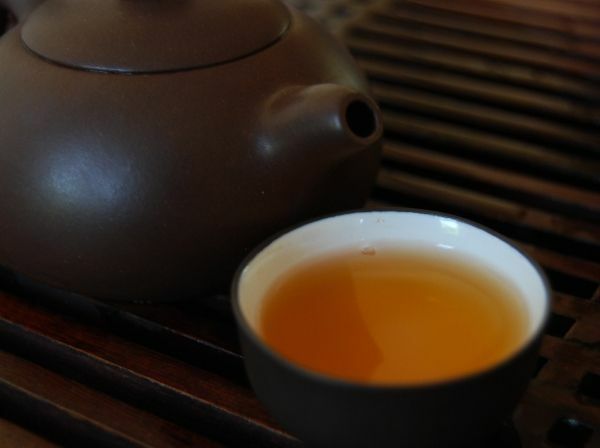 This tea cooks up a straight orange, and tastes malty and woody. 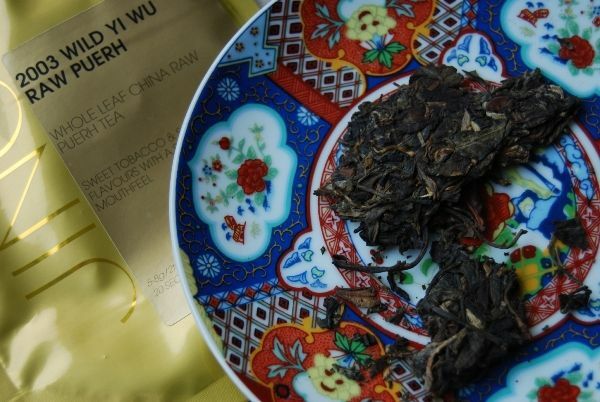 It has some sticky tar in the nose, reminiscent of huangpian [yellow flakes]. With some length to the body, ending in a very decent kuwei [bitter note], and almost possessing a huigan [sweet aftertaste], this is enjoyable. By the third infusion, it has become rather monotonous, and so I pack up the leaves into a flask to continue brewing in the background at work. 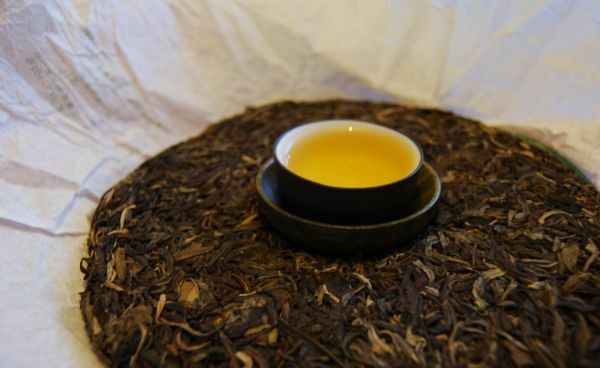 *Jing Tea has asked me to correct my price from £135 to £132.50. I'm currently stuck at a conference in the sweltering heat of the south of France. 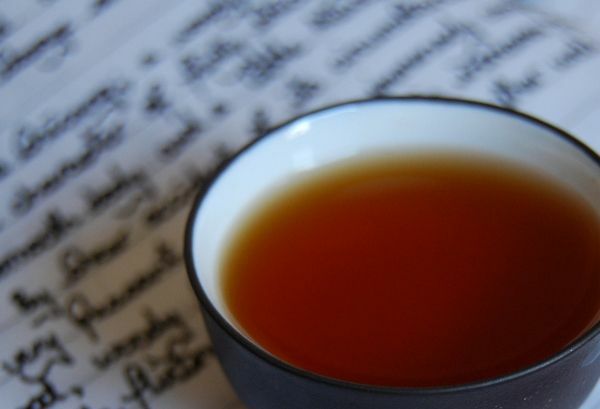 Though the UK is, apparently, the biggest nation of tea-drinkers after the Chinese, the average quality of tea in France really leaves the average quality of British tea in the dust (or fannings). I've enjoyed some lovely Darjeelings while here; while they are served in teabags, the bags have been muslin or silk, and contain long, whole leaves. The flavours are fresh, floral, and very smooth. Hats/berets off to the French. Mining the back-pages of Houde has turned into a hobby all of its own. I love the fact that Dr. Lee doesn't seem to put up the prices on his old cakes, which means that the older cakes can be a real steal. This is one of those steals. Along with Qianjianfeng [chee-an jee-ah fung], this Jifengyuan [gee fung yoo-an] brand is entirely new to me. I tend to love all things non-numbered-recipes from Changtai. 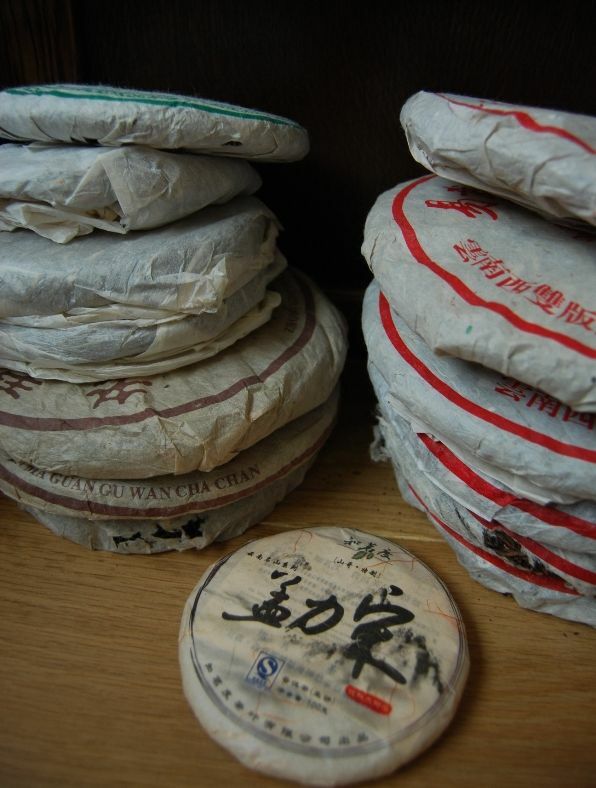 I also really adore shicang [sher-tsang, wet stored] pu'er, and don't have very much of it. Houde noted that this has had "Hong Kong" storage (i.e., shicang) until 2005, then Texan storage. Does that mean dipped in barbecue sauce*? Either way, it is still heftily shicang in aroma, but that's fine by me. I'm rather glad that the aroma hasn't dissipated. 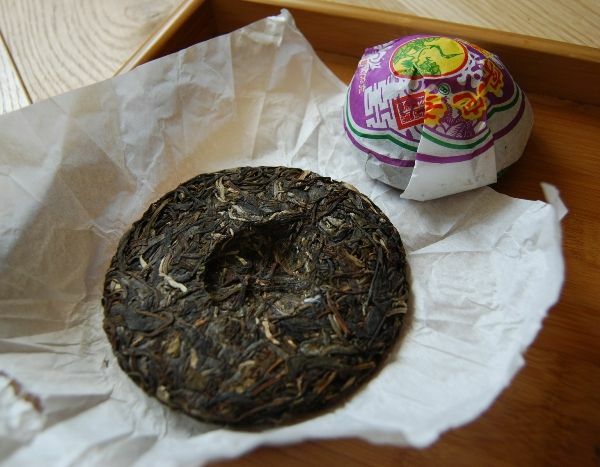 My tetsubin loves shicang pu'er, too. It emphasises the flinty, vanilla woodiness and really puts on a good show. The soup comes out a big, fat orange-red colour. 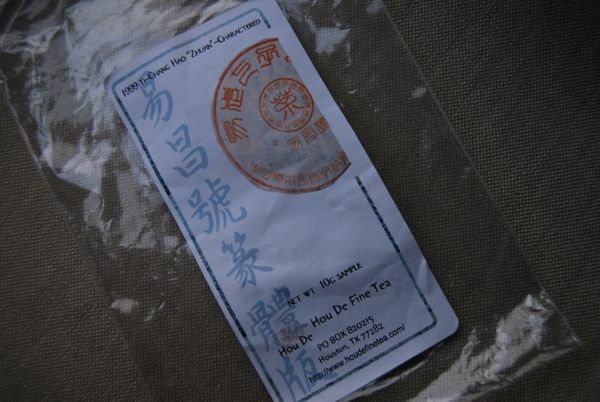 While not immensely complex, it is a very decent shicang tea. 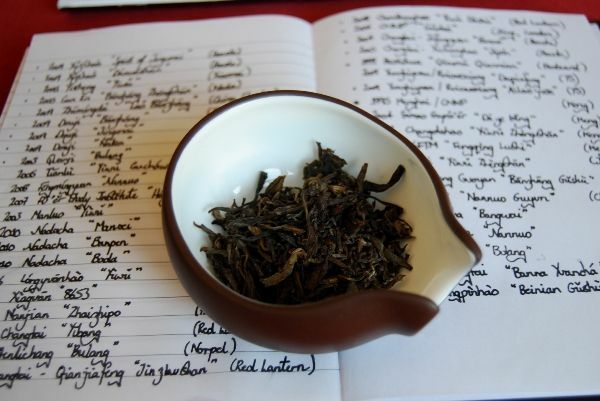 The woody flavours pile into the cup for a good number of infusions. This was $50 well-spent. What other treats can be found in the dusty nether-regions of vendors' web-pages?